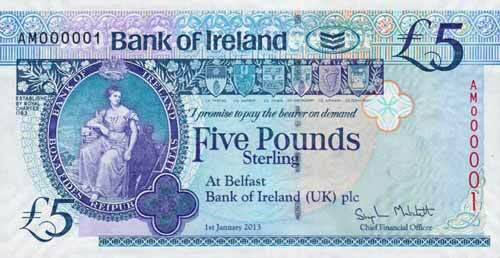 Low numbered banknotes, especially those numbered 000001 have always been sought-after by collectors. The closer to the start of a series, the more desirable the note is. Whilst low numbered notes command a premium, it is the very first number 1 note which is by far the most valuable. The earlier that number 1 and the rarer its issue, the more desirable it becomes. 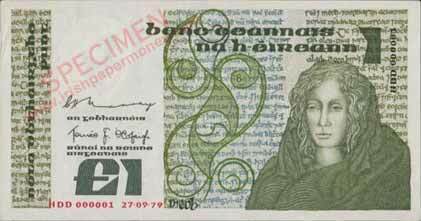 In general, Irish number 1 banknotes are rarely seen. 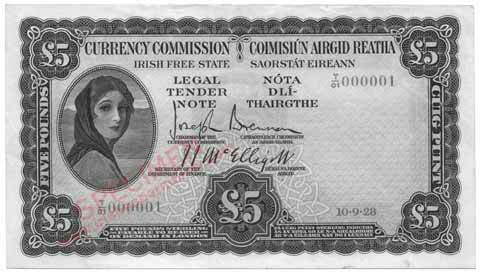 From what is known of the Currency Commission and Central Bank of Ireland issues, up to 2001, the very first note of a new signature of a lower denomination was retained by the signatories on a personal preference basis. 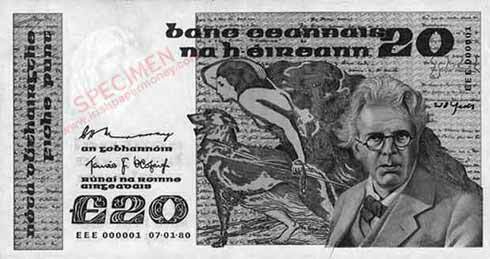 For example 10 Shilling note number A/01 000001 was retained by Joseph Brennan (this note is now in the National Museum of Ireland collection in Dublin). 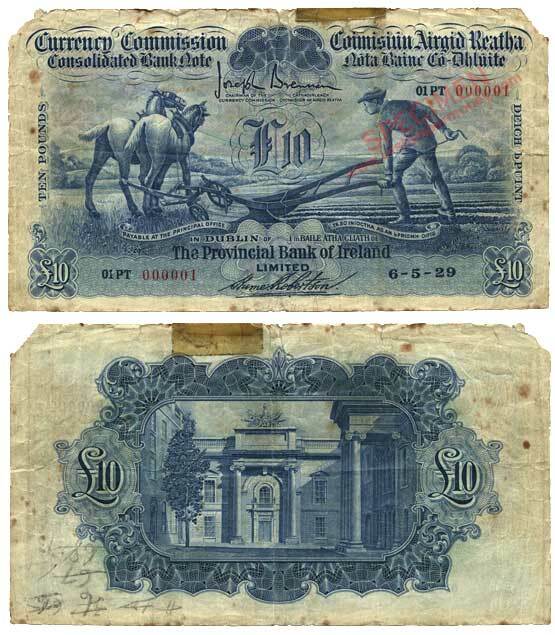 Similarly, first prefix number 000001 notes of all the 1928 denominations were possibly retained. Additionally, low numbers of these notes were retained by members of the Currency Commission. Later number 000001 notes were not likely to be retained: for example it is highly likely that 10 Shilling note number A/02 000001 was issued into circulation in the normal run of things. 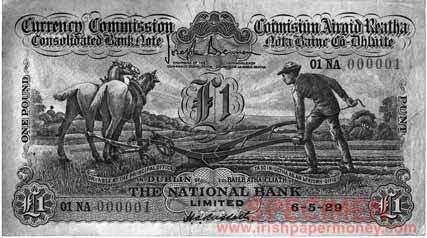 First issue number 000001 notes of denominations up to £5 have been recorded for Legal Tender A Series (Lavery) notes, Ploughman notes, and Old Notes (pre-1929) of the commercial banks. Some issues of pre-1929 notes started with a single numeral 1 without leading zeros. 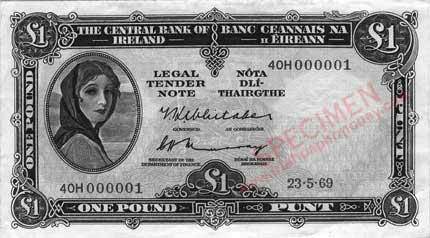 Generally, far more number 000001 notes have been seen of the later series of Irish banknotes: B Series, C Series, and Northern Ireland Issues. Once there was a demand for number 000001 notes from collectors people started to look for them in situ. The LRNC records all number 000001 notes which are encountered, as well as whether they are in the private collecting field, or in museum collections. PSS records all known Consolidated Bank Notes, which would include number 000001 notes. The A Series banknotes were in use from 1928 to 1977. Low numbers have been seen of the first prefix of a new Type when they mark a change of signature or of issuing authority. Very few number 000001 notes have been seen, and more earlier notes than later notes have been recorded. There are nine Lavery number 000001 notes recorded, seven of those are in museums. Below is a list of the low number Lavery notes that have been recorded and verified. M indicates the note is in a museum, P indicates a private collection. Grades are listed where known. The 10 Shilling and £5 notes numbered A/01 000001 and T/01 000001 respectively have been recorded, pictured below. Both notes are in the National Museum of Ireland in Dublin. Although £1 note H/01 000001 has not been recorded, it is known that it was retained by a member of the Currency Commission. 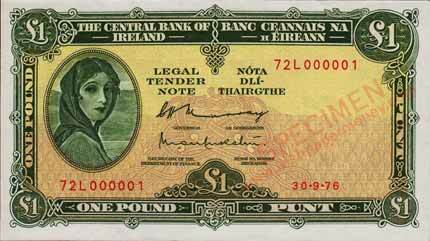 Very few post-1928 Lavery number 1 notes notes are known. The two One Pound notes pictured below are in private collections. 40H 000001 is the first note dated 23.5.69. Later low numbered notes, from the B Series and C Series, of the first prefix of a signatory, were also retained. Numbers 000001 and 000002 tended to be retained by entities such as the Department of Finance and the Central Bank of Ireland, possibly retained by the signatories in person, rather than by the institutions. Higher low numbers were then available to other individuals, with at least one number as low as 000009 being available to external collectors. Low numbered replacement notes were not preferentially retained, and occasionally a collector may come across one. £20 note EEE 000001 is in a private collection, as are EEE 000002 - EEE 000008. Examples between EEE 000010 and EEE 000020 have also been recorded. Low numbered banknotes of the first run of C Series notes have also been saved. The lowest recorded notes in private hands are £50 replacement note, RRR 000003 (circulated condition); £100 notes AAK 000009, and replacement notes KKK 000005 (circulated condition) and KKK 000009. There are five recorded number 000001 Ploughman notes, listed following. 01MA 000002 is also recorded, suggesting that 01MA 000001 is likely to have been retained at its time of issue, though there is not yet any evidence to suggest that 01MA 000001 has survived to the present day. 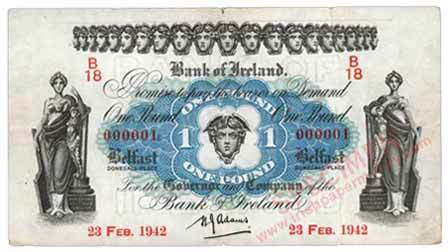 01BA 000001: Bank of Ireland £1 - this note is in the National Museum of Ireland. 01NA 000001, 01NK 000001, 01NT 000001: National Bank £1, £5, £10 respectively - these three notes are in a museum in Dublin. 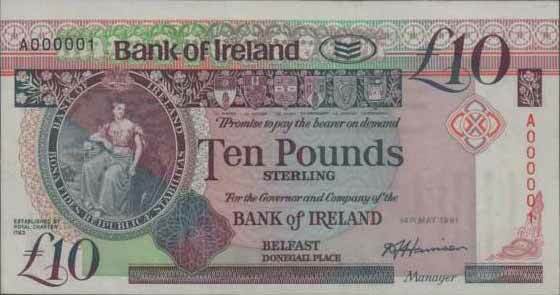 01PT 000001: Provincial Bank of Ireland £10 - this note is in a private collection, having been sold by DNW in auction in October 2018. This note is the second number 000001 Ten Pound note to be seen, National Bank note number 01NK 000001, pictured above being the other note. Judging by the condition of this Provincial note, and the pencil sum on the reverse, it appears that the note was in circulation, got paid into a bank and added to a bundle. The small sum on the reverse has been seen on many notes from cashiers, and is indicative of a running number, updated each time one or more additional withdrawn notes are paid in, and added to the pile. 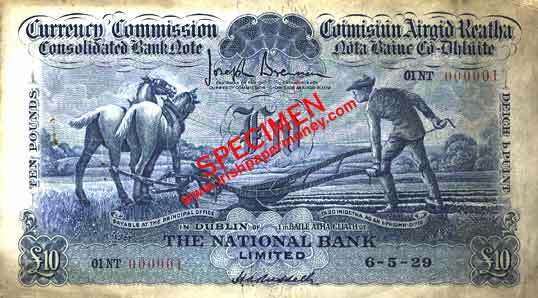 When a sufficient amount had been collected, the bundle would be remitted to the bank's cash centre, and then to the Central Bank of Ireland for destruction. Someone noticed this £10 note and saved it. 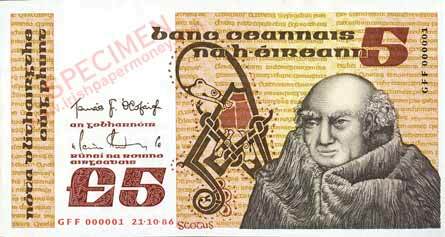 This is a banknote of the highest collector rarity and desirability from one of the more sought-after series of Irish notes. It is one of only eight Ploughman £10 notes with serial number 000001 to have been printed, and is the only number 000001 Ploughman note known in private hands. The fact that this note was issued into circulation would indicate that number 000001 Consolidated Bank Notes were not being retained regardless of denomination. Other £10 notes numbered 000001 may have been circulated, withdrawn and destroyed. 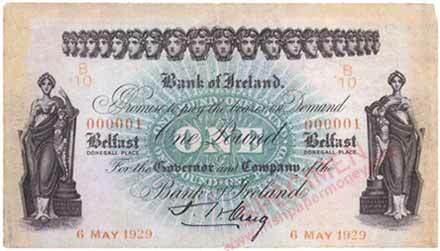 A few number 1 notes are known from the Old Note issues of the early 1800s, from the National Bank of Ireland and Provincial Bank of Ireland. Their survival is possibly because the first issued note was retained by the bank, or by an individual in the branch. 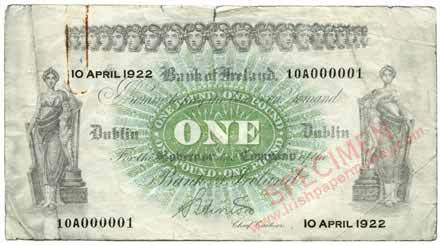 One later number 000001 note has also come to light, a Bank of Ireland One Pound note, 10A 000001, dated 10 April 1922, pictured below. This note is interesting in that it is the first One Pound note to be printed by the bank on both sides, and the first of its modern Series H notes. This banknote, along with 10A 000002 was retained by Sam Hinton, the signatory and Chief Cashier of the bank. It was sold by Whytes, Dublin in auction in 2016. 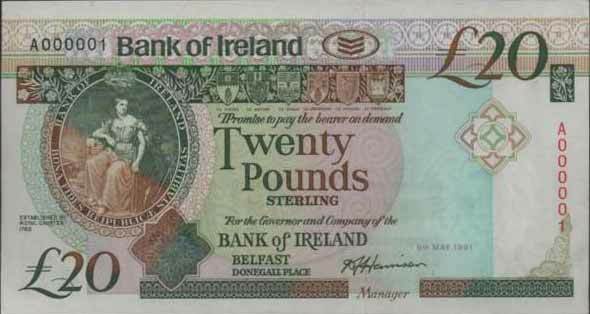 Some early number 1 notes from the Joint Stock Banks' Northern Ireland Issue are known. Later issues are somewhat more common, especially from after 1990 when the notes were searched for by collectors, and inflation made them relatively inexpensive to retain. 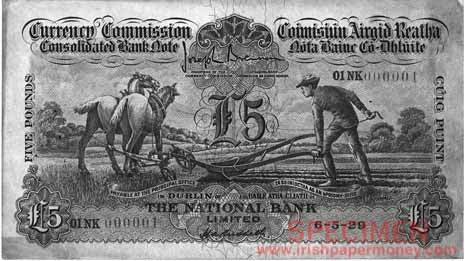 The search for low numbered Irish notes is on-going, especially for Ploughman notes. 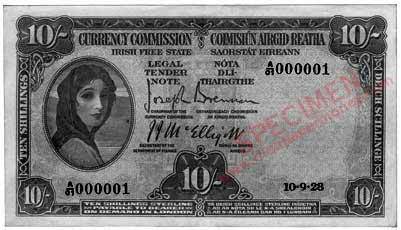 Updates will be posted on irishpapermoney.com/forum Number 000001 notes. This page will continue to grow as more notes are added. www.irishpapermoney.com • Version 2.1.0 • COPYRIGHT ©2000, 2017 M Mac Devitt. Reproduction with citation permitted.